Cycling is a low impact sport. However, knee pain is a common occurrence in cyclists. Studies show that 42 percent of American cyclists experience pain in their knees at some point. Cycling for longer periods of time, cleat position, saddle height, overexertion and using a fixed gear bike can all contribute to knee injuries and pain. These issues have a direct impact on connective tissues, leading to inflammation and pain. Pain occuring on the inside or outside of the knee can also be attributed to cleat placement. If the cleats on the bottom of your shoe are placed too far back or too far forward, it can make for a very uncomfortable ride. While hooked to the bike pedals, you should be able to rotate your feet comfortably in and out, creating a V shape. The position you are in should feel unforced and pain-free. If this test causes you pain, your cleats need adjustment. The incorrect placement of your saddle can also cause pain and injury. How close or far away your bike saddle is from the handlebars is known as the fore aft saddle position. If your saddle is too far from the handlebars, you will be unable to bike uphill without having to stand. In comparison, if your saddle is too close, your upper body will take the brunt of the ride. You may experience frequent pain in your hands and shoulders as well as pain under your knee cap. A low saddle height on your bike can cause serious knee pain due to compression while riding. Your patellar tendon, quad tendon and sub-patellar cartilage can all suffer severely if your saddle height is too low. 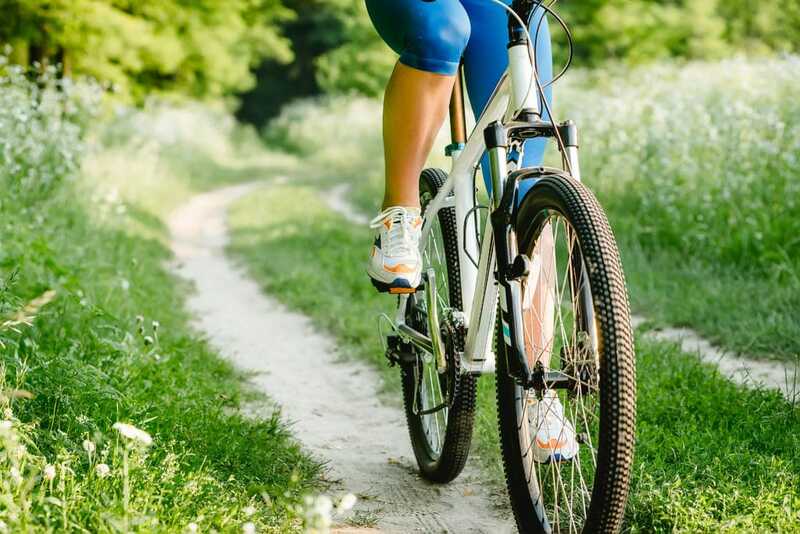 Patellar tendonitis is one of the most common injuries cyclists experience. It is due to overuse and causes inflammation of the affected tendon. If you experience sharp pain primarily on your knee cap or directly below it, you may be suffering from patellar tendonitis. The pain can continue even when you are off of your bike. Consider raising your saddle height in accordance with your height to prevent further injury and inflammation from occuring. If your saddle height is too high, it can also lead to injury. When your saddle height is high, it can overstretch your muscles and tendons. Typically, pain that is the result of a high saddle will be felt in your hamstrings or behind your knee. A higher saddle creates extra, unwanted tension causing unnecessary stress on your knees while cycling. If you rock back and forth while cycling, this may be a sign your saddle height is too high as well. You should not experience pain when you hit the bottom of your pedal strokes. If you do, your saddle is too high. If you are struggling to find the proper saddle height, visit a bike fit specialist. They can help fit your bike to your body, taking your height and leg length into consideration. Gradually increase your mileage and intensity. Making an immediate leap in either can lead to overuse causing knee pain. However, there are ways you can combat pain associated with overtraining. Stretch before and after each ride and always warm up. Use ice to reduce any swelling that occurs. Get plenty of rest between each ride. Elevation can be key to reduce inflammation and swelling as well. Strength training, particularly strengthening your whole core, can be beneficial to prevent extra stress on your knees and reduce your chances of knee pain. If you ride a fixed gear bike, you may be more prone to knee injury. Fixed gear bikes have no brakes and do not have the ability to coast. Your legs must be constantly moving if your bike is moving. It’s common for fixed gear cyclists to experience pain behind their knees. These cyclists are more likely to strain their hamstrings while decelerating their bike. To prevent overuse on your hamstrings, alternate between a fixed gear bike and a single speed bike. If you are still experiencing knee pain after making the appropriate adjustments, consider visiting a medical professional. You may have an underlying condition or an injury that needs to be treated by a doctor. Your pain and injury may get worse if you wait. At Arizona Pain and Spine Institute, our medical specialists are experienced with pain management and sports injuries. Make an appointment today to begin your recovery!